I have just been reorganising all my framed art as a result of getting the house back to normal after all the hurricane dangers in coastal Georgia; very kind friends had put everything up high in case of flooding. It was mercifully unnecessary but I needed to put everything back together again. As I did so, I found myself going on a memory trip. A vivid trip too, one that swept me back many years in some cases and in unexpected ways. I have always found that perfumes and music are intensely evocative but had not thought so much about images, especially ones that I personally created. A study of red cedars that I drew when out working in the marshes and islands of coastal Georgia, for instance, brought back the feel of the breeze, the sweet, cheerful chatter of painted buntings flitting above me in the trees, the shimmering views of the salt-laden marshes stretching out to the horizon. Another red cedar I drew in silverpoint took me back to my magical stays on Creighton Island. Perched right on the edge of the marsh, I marvelled at how this proud tree clung on in the oyster shell-laden sand, right at the edge of higher ground, defying the winds and eroding rain. While I was drawing it, the "wild" pigs, whose distant ancestors arrived with the original Spanish in the 16th century, were rootling noisily and enthusiastically in the damp ground just beyond where I was sitting. It was hot and sticky, but I was so fascinated by this wonderful tree that I was oblivious to the insects swarming. As I worked through the piles of framed art, I realised that I have spent a lot of time on the barrier islands up and down the Southeastern coast, as artist in residence. Precious times of fascinated solitude, as I learned about the complex ecosystems on these islands that withstand hurricanes, storms, heat, rain and drought, to say nothing of human activity. 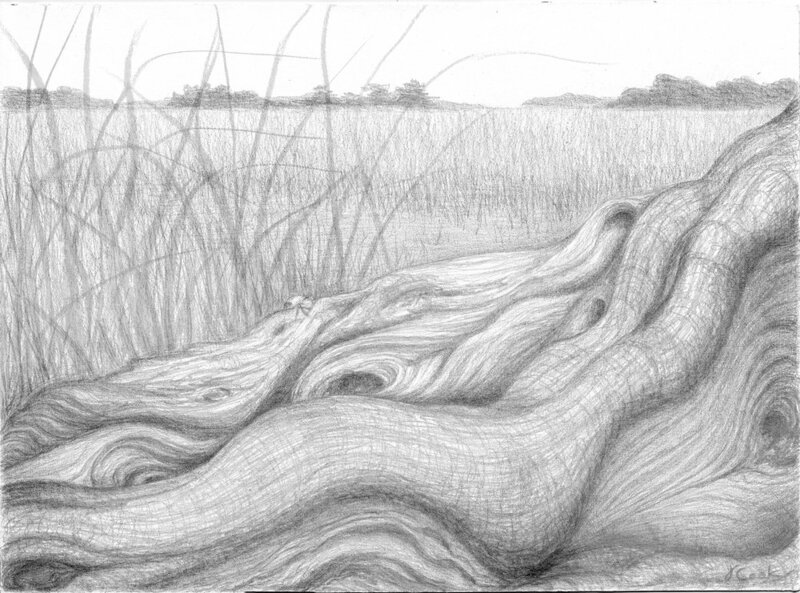 Another silverpoint drawing I found made me laugh: I can still feel the moment of shock and amusement as I sat drawing yet another red cedar tree, lying almost prone towards the marsh, hollowed to some degree and, as I suddenly discovered, home to a very large and curious rat snake. We peered at each other quietly and intently for quite a while until this lovely snake slide elegantly away out of sight. I could not resist just putting in the head of the snake peeping at me over the edge of the tree trunk! Marsh Survivor, silverpoint, Jeannine Cook artist. So many memories flooding back because of the drawings made me measure the passage of time. Another silverpoint that brought back vivid sensations was one I drew in the sand dunes just behind the beach on Sapelo Island. I was there with my friend, Marjett Schille, and she was off painting a little way away. We had both reminded each other urgently that these dunes were the rattlesnakes' kingdom and we needed to be careful. The heat was intense and the noon sun blinding: I crouched in the meagre shade of an umbrella that kept toppling over in the wind as the sand was so dry that it would not hold. Despite the conditions, I grew entranced with the minute tracks of some hardy insect that had climbed the sand dune mountain. I felt myself being transported back there as I looked at the drawing again. Another sort of memory came floating back to me when I found another graphite drawing. Again on Sapelo Island, always aware of its special character, I delighted in finding unusual natural objects to draw. I suddenly found an old, fallen live oak tree whose trunk had weathered down to its amazing sinews. It was lying on a cool, shaded bank, and the two drawings I eventually did took me to a quiet, contemplative place, where the intricacy of the oak seemed to weave a spell of wonder that mixed peace with an awareness that even after death, these live oaks offer both beauty and refuge for other species. I saw innumerable small scurrying insects threading in and out of the wood. So fascinating. Travelling back in time, thanks to all the drawings I was putting away again, was a delight for it made the job go easily. I was reminded, too, of the hours of fascination I have been lucky enough to have as an artist working in coastal Georgia over the years. The art really was a powerful "aide-mémoire".